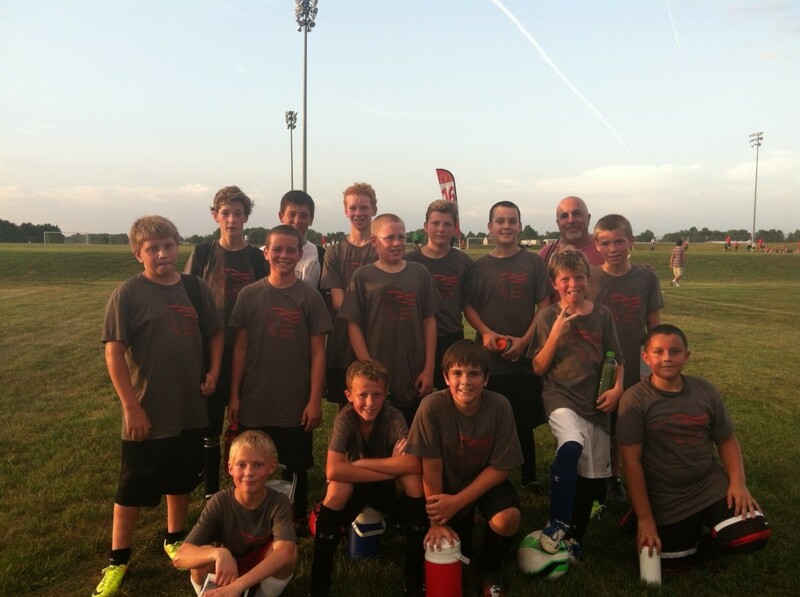 The Nixa Varsity Soccer Team lost to Pershing in the Middle school finals 4-0 last night under the lights at Cooper 1. Both teams walked onto the field in World Cup fashion and were announced to the better than normal crowd of parents and spectators. that we thought was off sides. Pershing scored their second goal with 2 minutes left in the first half off of a corner kick and Nixa sat 2-0 going into the half. The second half was a battle from the start, and after another 35 minutes of play, Nixa took second place with a final score of 4-0. Nixa had a few opportunities to score, but could not find the back of the net. Hats off to all the players, especially all of our 8th graders as they move on to HS next year. Nixa finished their season in second place with an overall record of 5-3-0 for this season. 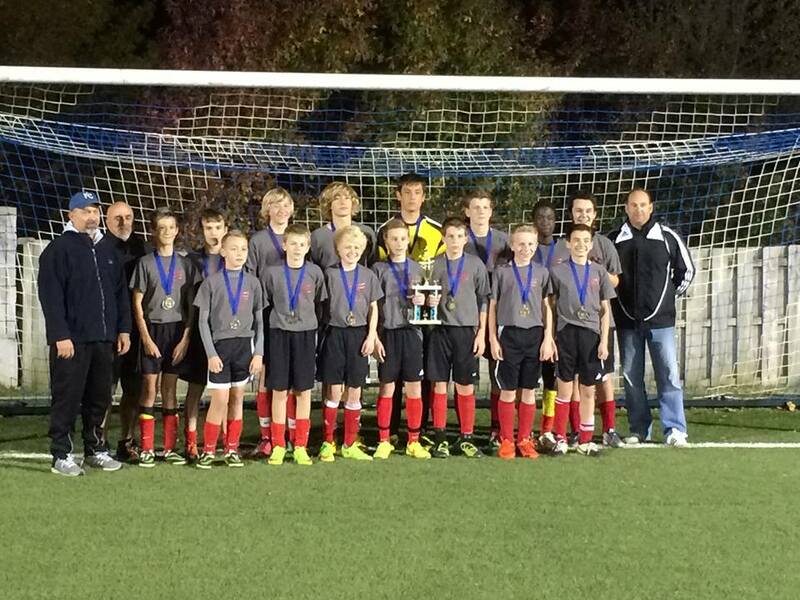 This 8th grade team had an overall record in middle school soccer of 17-5-2, since 6th grade. The Varsity team sets its sights on post season tournament play starting next Thursday October 24th when Nixa plays Catholic Middle school in the Semi-finals at 7:30PM at the Lake Country Soccer complex. The winner of Thursday night’s game will go on to the Championship Final played on Monday October 28th at 7:30PM against Pershing Middle School. Nixa is in second place and is in a great position to win a middle school championship. We ask all the Nixa Soccer Supporters to come out to Lake Country on the 24th and if advancing the 28th to help root on your Middle School Varsity Team. The Nixa Boys Varsity soccer team ended the regular season with a record of 4-1-2 (W-L-T). The Eagles soccer team will start tournament play next Tuesday night when they play Pershing at 7:30 at LCS. If they advance, they will play on Thursday night at 6:00 for the championship. Great job and great season end to the Nixa JV1 soccer team last night. The JV1 Squad beat Ozark 9-1 and clinched the COC Division victory for Nixa. The team went 7-0-1 (W-L-T) this year, with an undefeated season. 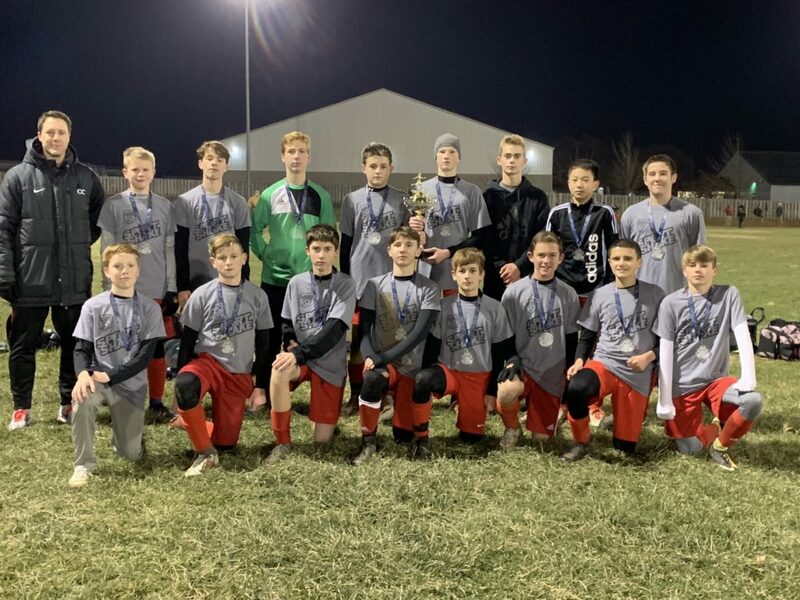 Scoring 59 total goals and only letting in 7 goals for the 8 game session, the boys dominated their opponents and were crowned champions last night out of the 11 school division. Goals last night came from Brady Harrison (3), Harrison Schober (3), Jake Romero, Adam Boehmer, and Tanner Powley all contributed 1 goal apiece. Jakob Price and Ezra Prather shared the keeper duties. The Eagles had a great season and the whole team is to be commended on their style of play, dedication to the sport, and their commitment to each other and the team. Great Job and Well done boys!!! The Varsity team played well against Catholic. The whole team continues to play well as a unit and was able to outscore Catholic by 7-0. Goals came from hunter Wilson (2), Parker Crawford (2), Jacob Romero, Brady Harrison, and Tanner Powley all had one goal. Jonathan Ghering recorded the shutout and the team moved to a 2-1-1 record for the season. Next game will be October 22nd when Nixa plays Catholic at 7:30PM The Varsity boys continued to play well, but not as hard as they usually do. The boys played a weaker Carver team to a 3-0 victory with goals coming from Jakob Voi, Parker Crawford, and Victor Arias. Jonathan Ghering recorded another shut out playing keeper for the Eagles. This pushes the boys record to 3-1-1 and sets the stage with two dominant teams emerging from the league, Nixa and Cherokee. The November single elimination tournament should be a good one if the boys continue to play strong. The JV1 Boys soccer team came out strong against league rivals Cherokee. Nixa dominated the game with 85% possession and 20 shots on goal. Unfortunately, the team was only able to convert one goal by Adam Boehmer into the books. Tanner Powley made a baseline run with the ball in the first half and pushed it back out to Tanner Hartman who scored early, but was called on a questionable off sides call. Cherokee only had one play where they broke through our defense and had a 1v1 with our keeper Jacob Price. Jacob did a great job cutting the angle down but Cherokee did a great job on finishing, giving them their only goal. The boys played great, but could not convert any other of their scoring opportunities. The team remains undefeated with a record of 5-0-1 and looks forward to their next opponent. Next and last Game for JV1 will be October 16th when they play Ozark for the championship at 7:30PM. The JV1 team had a rocky start in the first half against Springfield’s Catholic, but came alive in the second half of play. This team remains strong and is a well-knit unit. The boys played well better possession in the second half and had a more composed and controlled game. Goals all came in the second half with Abe Martin scoring 2 and Harrison Schober knocking in one. Tanner Powley had all three assists for the goals. Jakob Price recorded the shutout as keeper, and the rest on the team again delivered a solid performance in all positions. The team remains undefeated and will play for the League Championship on Tuesday October 16th at 7:30PM against cross town rivals OZARK. Please come out in Red and cheer on your JV1 soccer team. The JV2 boys had a double header on the 4th and started off the night well against Ozark. With the boys playing well, goals came from Daniel Brink, Ezra Prather, and Ethan Pellegren had (3). Goalie duties were shared by Abe Martin and Isaac Diagle. Facing their toughest opponent in their league for the second game, Nixa came out strong, but with already having a 70 minute game under their belts, struggled to finish in the second match. Jakob Price ripped a hard left footer past the NC keeper to give the Eagles a their only goal for the night. Isaac Diagle and Nathan Hirsch shared the keeper duties. Next and last Game for JV2 will be October 18th when they play New Covenant at 7:30PM This team keeps growing and getting stronger as the year progresses. The boys are doing well at figuring out their roles on the pitch and learning how each other plays so they can make better decision during the game. The 11-2 win against Ozark solidifies this and goals this week came from Ezra Prather (3), Trenton Prather (3), Harrison Schober (2) and Ethan Pellegren, Nathan Hirsch, and Alexander Thatcher each had one. Harrison Schober and Isaac Diagle shared the keeper duties. JV2’s last game will be against New Covenant next Thursday night at 7:30PM. Come out and cheer on the boys. The Varsity team played against a very skilled Cherokee squad last week and had a great first half, but struggled to find the nest in the second half. We new that this would be the toughest game of the season and held Cherokee to a 2-1 first half score. Parker Crawford scored first for the Eagles in the first minute of play and it took Cherokee 15 minutes to find the back of the net. The Eagles let a restart in in the last minute of the first half to go down 2-1. The second half found the Eagles flat at times and the Eagles took advantage of that by scoring 4 unanswered goals. Cherokee is still our strongest competition in the league, and I am sure the Eagle squad will face them again in the championship tournament in November. The Eagles took a few minutes to get into the rhythm of the game, but once the boys found their pace, it began raining goals. The Eagles defensive four of Ross Lindeman, Mitchell Dent, Jason Norton, and Kevin King remain very strong for the Eagles. Building on the defense, the mid’s and forwards have a lot of flexibility in their positioning and play. Combinations and goals last night came from Hunter Wilson -2, Parker Crawford -2, Jacob Romero, Brady Harrison, and Tanner Powley. Jonathan Ghering had the shut out in Goal. The boys continue to play well and get stronger. The JV1 Boys soccer team came to play last Tuesday night against Pleasant View. The Eagles commanded the possession on the field and once they settled into the play, they began hitting the back of the net. The defensive back of Jacob Voi, Trenton Prather, Riley Hobby, and Tyler Clubb has been very solid all season and has allowed the mid’s and forwards to be very secure in their style of play. The boys got on the board early with goals coming from Tanner Powley (2), Brady Harrison (6), Abe Martin (3), and Jake Romero (1). Jake Price had the first half shut out playing keeper and Abe Martin had keeper duties for the Eagles in the second half. The boys played a very controlled game and dominated possession throughout its entirety. The Eagles have stretched their record to 5-0-0 for the season. The JV1 team has their eyes set on Cherokee tonight with the game starting at 6:00PM. The JV2 boys did much better playing against New Covenant the second time around. The players worked hard the entire game and did not let down, while scoring 3 of their own goals. Goals in the game came from Ezra Prather (2) and Abe Martin (1). The boys continue to build, grow and learn the dynamics of the game and are constantly getting stronger and more competitive as the season progresses. The Varsity team did not have a game this week but is preparing for their toughest match of the season against Cherokee next Monday night. The JV1 Boys soccer team came to the pitch again Tuesday night hungry to play Pershing. The Eagles took the first 10 minutes to settle into the game and find their stride. The boys got on the board at the 15 minute mark and then never looked back. Goals came from Tanner Powley (2), Brady Harrison (2), Abe Martin (2), Adam Boehmer (1), and Harrison Schober (1). Jake Price had the first half shut out playing keeper and Ezra Prather had keeper duties for the Eagles in the second half. The boys played a very composed and controlled second half and have now stretched their record to 4-0-0 for the season. The JV1 team has their eyes set on Pleasant View next Tuesday night at 6:00. The Varsity Boys were evenly matched this week with a very quick and skilled Pershing team. It was a back and forth contest with Nixa hitting the post on shots twice and not being able to put away two other opportunities. Pershing had their chances as well and Jonathan Ghering came up big by saving one penalty kick and another free kick just outside the 18 yard box. The whole team did a great job against Pershing but Jonathan Ghering gets the “Man of the Match” award for his efforts. The JV1 Boys soccer team looked great last Tuesday night as they played against Jarrett. The MS Eagles played very composed and controlled the tempo of the game from start to finish. Goals for the game came from Brady Harrison (3), Tanner Powley (2), Jake Romero (3), Jacob Price (2), and Abe Martin (1). The eagles won the game decisively 11-1 and the keeper duties were split by Jacob Price and Ezra Prather. The team had a great effort all around and will be getting into a tougher schedule in the upcoming weeks. The JV2 boys struggled against a very big and physical New covenant team last week. The players did not let down and did not allow any goals in the last 30 minutes of the game. Nixa will play NC again later in the season and we will be ready for them. The JV1 Boys soccer team looked great this week coming off a win on Tuesday against Pershings Red team by a score of 8-2. Jakob Price had the keeper duties for the game and goals came from Haden Olsen, Abe Martin, Drew Murray, Tanner Powley, Brady Harrison (2), Adam Boehmer (2). The boys worked the ball very well this week and looked solid all the way around the pitch. Next match is on Tuesday the 11th against Jarrett at 7:30. The Varsity boys soccer team opened their season well with a 6-1 win over Carver Middle School on Monday. The team looks pretty solid this year and we are looking forward to a great season. Goals in the game came from Brady Harrison with a beautiful left foot volley out of the air. Tanner Powley and Adam Boehmer had a nice combination of passes from a corner kick that sent a long high, far post ball to Jason Norton who knocked it in for a goal. The man of the match was Parker Crawford with three unassisted goals and a fourth goal from a defensive splitting pass via Tanner Powley. Kevin King, Jason norton, and Hunter Wilson was rock solid only allowing one goal via a miss communication. It was a great start to our Varsity Season. Next game will be Monday September 10th at 7:30 against Pershing MS at the LCS complex. The JV1 boys soccer team opened their season last night with a 6-0 win over Bolivar MS. The team returns 100% of last year’s team and adds a couple new and welcomed faces. Goals in the game came from Brady Harrison – 2, Abe Martin- 2, Adam Boehmer and Jake Romero each had one goal. The boys played very composed and put a lot of good passing strings together to dominate the play. The defensive line of Riley Hobby, Jacob Voi, Trenton Prather, and Haydon Olson was rock solid with their performance. Jacob Price had the goalie honors for the evening and earned the shutout. All the boys played very consistently and they are looking forward to a great season of soccer. The boys next game is Tuesday September 4th at 6:00 PM against Pershing MS at the LCS complex. The JV1 soccer team played well against the Catholic team on Tuesday night. The boys dominated the possession time and found holes in the Catholic defense. Jaxon Adams passed a ball through to Abe Martin who scored first for Nixa. Jacob Romero had a break away and scored the second goal for Nixa. One of Catholics players had a hand ball inside the penalty box and created a PK. Tanner Powley sealed the deal on the PK and Nixa won 3-1. Brady Harrison and Jacob Price split the keeper duties for Nixa. JV1 plays Tuesday against Pershing. The JV2 squad, playing with no subs for the evening went into half time with Ozark 2-1. The boys really stepped it up in the second half, and after making some minor field adjustments went on to beat Ozark 7-1. Adam Boehmer had (3 goals, 2 assists) Tanner Powley had (2 goals, 3 assists) Brady Harrison had 2 goals. Brady Harrison and Jakob Price shared keeper responsibilities for the evening. The boys loss a very disappointing game to Catholic Tuesday after dominating the majority of play, but not being able to find the back on the net. The team worked hard together, but were not able to get the equalizer when they needed it. Jakob Price had keeper duties for the night and Adam Boehmer, Jacob Romero, Tanner Powley all had goals. The varsity keeps improving as they are headed for tournament play in a few weeks. The team beat Cherokee 3-1 with the hat trick coming from Logan Tyler (All three goals). Zach Norton played keeper the first half and Jonathan Ghering had keeper duties the second half. In the best effort yet given by the varsity team, the boys downed Pershing 3-2. Goals came by Trustin Baker (2) and Logan Tyler (1) with Trustin having the assists. Jonathan Ghering had keeper duties. The boys had a great come back game on Thursday night. They were down 3-1 going into half time, but fought back to tie the game 3-3. Matt Wilson had two goals and Harrison Schober had one as well. The keeper duties were split between Brady Harrison and Jakob Price. All the boys had an excellent game on Thursday night and should be proud of their play. The boys had a rough first half in the game against Pershing and went into half time with a 3-2 lead. After making some adjustments and talking about what was happening on the field, the boys really changed their play and stepped it up in the second half. The Nixa team dominated the field of play and possession in the second half and buried two more goals, winning the game 5-3 against a very physical Pershing team. Goals were scored by Brady Harrison (2), Adam Boehmer (2), Jacob Romero (1). Assists came from Adam and Jacob as well. Jakob Price and Brady Harrison shared keeper duties for the night. The Varsity boys played a good game against Catholic holding them to a 1-1 tie in the first half of play. Catholic was able to put together two quick counter attacks that Nixa was not able to defend properly and ended the game after 70 minutes’ of play with the score 1-3. Trustin Baker fed Logan Tyler who scored the one goal for Nixa. Jonathan Ghering had keeper duties for the night. The JV1 squad held the Cherokee team to 0-1 score at half time, but struggled in the second half to find the goal. The Nixa players had many attempts to put the ball in the back of the net, but were unable to convert the opportunities as needed. Final score of the game was 0-4. Jonathan Ghering had keeper duties for the night. The game for Thursday night got rained out and was played on Sunday afternoon. The boys came out and had a great showing beating Cherokee 2-1. There was a lot of good effort by all on Sunday. Brady Harrison had both goals for the game with assists coming from Tanner Powley. Jonathan Ghering had keeper duties for the game. Boys Varsity Soccer played Cherokee last Monday and had a good showing, but could not seal the deal in the final minutes. Joey Clem had the nights hat trick for Nixa with one lone goal and two assists coming from Logan Tyler and Trustin Baker. The boys played a hard 70 minutes, but fell just short of the victory. The varsity team faces Catholic this week. The JV2 Boys played a decent first half against New Covenant holding them to a 0-1 half time score on Thursday night. The second half found the team struggling to keep up with a team from New Covenant that were laden with 8th and 7th graders facing a team made up of primarily 6th graders. The boys played hard, but were unmatched in height and speed and the second half gave up 6 more goals. The JV2 squad faces Cherokee this week. The JV1 squad looked to face a daunting team from Ozark in size and speed Friday night under the lights, but ended with a respectable outcome. This was one of the best games this season to watch and the Nixa players were ready to face their opponent. Outsized in height, the Nixa team made up in skill, speed and endurance. The team held Ozark to a one goal margin at the end of 70 minutes. Jonathan Ghering had keeper duties and the whole JV1 roster had and outstanding performance and effort on the field. The JV1 team faces Cherokee this week. The boys played very well during the JV1 game against Greenwood. Jonathan Ghering had keeper duties and recorded the shut-out. Drew Murray scored the first goal with a beautiful feed from Adam Boehmer. Jacob Romero had a lone goal after going up the middle and finding the right corner of the net. Adam Boehmer scored a lone goal in the second half and put another one away after some great combination work with Tanner Powley. Jakob Voi had an outstanding game as stopper. JV1’s next game is Tuesday against Ozark. The Varsity played hard for their first match but did not come out ahead after the final whistle blew. Nixa scored in the 3rd minute from a Logan Tyler throw-in which hit Zach Norton who drove it into the back of the net. Pershing scored in the 16th and 62 min of play. Jonathan Ghering had keeper duties for the night. Varsities next game is against Cherokee on September 12th at 6:00PM. The JV1 team came out strong in their first game and dominated the possession and play for the majority of the game. This team is comprised of 13, 6th graders and 2, 7th graders and was the first time for the 6th graders to play 11v11. Bolivar had a couple of tall, 8th graders on their team and used that height and speed to their advantage. Bolivar had only three break aways during the course of the game and unfortunately were able to convert those into goals. Brady Harrison had keeper duties for the night. JV1 next game is Tuesday September 6th against Greenwood at 7:30PM. The JV2 team came out strong as well last week and dominated the majority of the play. The teams fought back and forth and battled down to the last 6 minutes when Tanner Powley was taken down inside the penalty area, was injured, and had to be removed from the game. Nixa was not awarded a penalty kick and the teams played to the final score of Nixa 3 and Ozark 4. Goals for Nixa came from Tanner Powley, Adam Boehmer, and Brady Harrison. Jakob Price had keeper duties for the night. JV2 next game is Thursday September 8th against Jarrett at 6:00PM. I wish all of the 8th graders well as they transition into high school and I look forward to next years 2011 squad. Nixa JV2 finished with a 5 – 1 victory against Bolivar. Trustin led the scoring with 3 unassisted goals. Cameron added 2 with one being assisted by Trustin. Bailey was in goal the first half and the last half of the second half. John started the second half as keeper. The NJH JV1 soccer team defeated Greenwood on Tuesday by a score of 6-2. Goals were scored by Andrew Brink, Trustin Baker(4) Marcus Johnson with assists coming from Bailey Hinkle, Joseph Nickell, Marcus Johnson. Jonathan Ghering had the keeper duties. This concluded the JV1 Teams season with a final record of 5W-1L-2T. The Nixa JV1 team had an excellent season and congratulations goes out to all the boys. The JV2 team has two more games and will finish their season next Thursday. The NJH Middle School Soccer Team’s will be recognized on Monday October 25th during the half time of the Nixa High School soccer match against Central. This is the High Schools last home game for 2010 Season. The NJH JV2 Soccer team beat Republic Thursday night with a score of 9-1. Goals came from Peyton Gerkin (2), Tristan Salkil (2), Trustin Baker (2) , Bailey Hinkle, Cameron Montana, Caleb Davis with assists coming from Trustin Baker and Ben Daniels. The keeper duties were covered by Jonathan Ghering. JV2’s record now stands at 4-1-1 and their next games is this Thursday against New Covenant. In keeping with the theme this fall season, the NJH JV1 soccer team handily defeated the Ozark soccer squad by a score of 4-0. Bailey Hinkle recorded the shut out. Goals came from Marcus Johnson, Trustin Baker (2), Andrew Brink, with assists coming from Trustin Baker, Peyton Gerkin, and Hunter Powley respectively. The JV1 Soccer team beat Republic last week 3-0 with all three goals coming from Trustin Baker who earned the hat trick. Congratulations to the Nixa High School Varsity soccer team for beating Ozark last Thursday. The JV2 Soccer team defeated Catholic with a score of 3-1. Great job to all the Nixa Soccer players last week! The JV1 Soccer team plays Ozark Tuesday night at 7:30. The Nixa JH JV2 Soccer team played Fair Grove and had a commanding performance by all. The goals came by Trustin Baker (4), Andrew Brink (3), Hunter Powley (2), Seth Rinker and Peyton Gerkin both had one for a total of 11 goals to Fair Groves 1. Sharing the keeper duties for the game were Jonathan Ghering, Parker Crawford, and Peyton Gerkin. The JV2 our now 2-1-1 and are half way through the season. The Nixa JH JV2 Soccer team played Carver yesterday and tied them in a high scoring game. Nixa Goals came by Cameron Montana assisted by Trustin Baker: Peyton Gerkin assisted by Trustin Baker. Peyton Gerkin assisted by Trustin Baker; Seth Rinker unassisted; Cameron Montana assisted by Parker Crawford; Peyton Gerkin assisted by Parker Crawford. The Goal keepers were John Ghering and Bailey Hinkle. Final score for the game was 6 to 6. JV1 plays Catholic this Tuesday and JV2 plays Fair Grove on Thursday. The Boys Varsity Soccer Team beat Willard Monday night 7 to 1 with a great showing by the Varsity team. Marcus Johnson, Austin Haist and Trustin Baker all had one goal each, while Hunter Wilson and Joey Clem scored 2 goals a piece. The team really worked together and showed great signs of their unity on the field. Next game for the Varsity will be next Thursday at 7:30 against Cherokee. The Junior Varsity Team will play New Covenant tonight at 7:30. The Boys Varsity Soccer Team played another hard fought match last week against Catholic. Final score was Catholic 3 and Nixa 0. The Junior Varsity team also played Catholic over the weekend and won 9-1. The Varsity team is off this week, but the Junior Varsity plays Thursday night against Cherokee at 7:30. Good Luck! The Boys Junior Varsity Soccer team beat Willard last Thursday night 5-0, extending their winning streak to 3-0 for the season. Mitch Dotson had two goals and Peyton Gerkin had three. The Boys Varsity Soccer team had a hard matched game in the rain last night against Cherokee. Jonathan Snowden was taken down in the first half of play with an injury and will be out for a couple of weeks. Josh Pittser had an amazing game and was challenged many times by the strong Cherokee offense. Joey Clem scored the lone goal for Nixa on a break away in the second half. Final score for the match was Nixa 1 and Cherokee 3. You can click below to get the PDF schedules for Varsity and JV2.